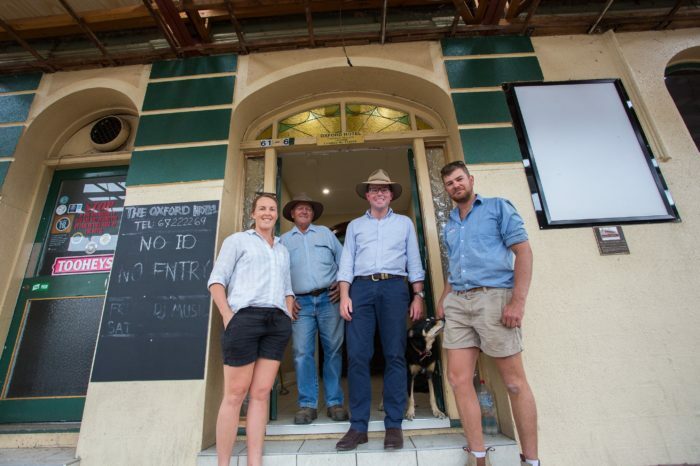 Emily Jorgensen, left, Gary Cracknell, Northern Tablelands MP and Brett Tomlinson at the front entrance of the historic Oxford Hotel in Inverell. NORTHERN Tablelands MP Adam Marshall says a $40,000 State Government heritage grant is helping bring a beautiful new-old front façade for the historic Oxford Hotel in Inverell’s Otho Street. Mr Marshall said the funding would go towards what is expected to be a $1.5 million renovation of the historic pub. Long-time local residents and Bundarra property owners Wendy and Gary Cracknell bought the old Oxford Hotel 18 months ago and have with their now-partners, Gary’s builder nephew Brett Tomlinson and his fiancée Emily Jorgensen, are undertaking what Mrs Cracknell’s says is a labour of love to return a grand old dame to her former glory. “We were semi-retired when Gary saw it was up for auction and we went and had a look. I don’t think it has had too much loving in the recent past but as soon as I walked into the place I felt a special ownership and I just wanted to do it,” Mrs Cracknell said. Mr Marshall says what’s happened since is a testament to the Cracknell’s sense of Inverell history and belief in restoring and retaining the heritage of a beautiful building. “The hotel was built in 1886 but the second storey verandah which runs the width of the pub was pulled down in about 1958 and replaced with five small balconies about two foot wide and then they were removed as well,” Mr Marshall said. Mrs Cracknell says work has already been completed on renovating and upgrading the bar and kitchen areas, and nine rooms upstairs have also been renovated with modern conveniences, with about another nine to undertake. “We have just started on the verandah and the ironbark timber flooring is going in this week,” she said. Mr Marshall said the owners of the three properties had collaborated to undertake reconstruction works as a trigger to improve the streetscape but also the economic prosperity of the Inverell town centre, through an imaginative and dedicated beautification and adaptive reuse project. “What they’re doing is a wonderful thing, not just for our history and our heritage but also for the people of Inverell,” Mr Marshall said. Mrs Cracknell said they were hoping to find tenants who would take on the commercial investment of running a restaurant, boutique bar and accommodation business, but were not looking to do that themselves. “I wasn’t really interested in history before I stumbled into the Oxford,” she said.